This page is dedicated to the frequently asked questions about standard first aid courses. These questions and answers have been compiled from a number of training partners located throughout Canada. Our training partners are located in Vancouver, Calgary, Kelowna, Edmonton, Saskatoon, Regina, Ottawa and Winnipeg. For more information about our training providers visit the locations page from the main or side menu. How long does it take to finish a standard first aid, CPR and AED course? Course length varies from 13.5 to 20 hours depending on provider, training partner and ultimately the instructor. I have previous first aid experience, can the course be shorter? Unfortunately, the instructor must teach the minimum allotted time. 13.5 hours is the minimum amount of class time spent on the course. What level of CPR can I have accompany my standard first aid course? Candidates have the option of select CPR level “A”, “C” or health care provider CPR with the course. I have lost my certificate and want to re-certify, what should I do? Contact your previous provider (workplace approved, St. Johns Ambulance, etc.) and have them issue you your previous certificate. Which is the best provider for standard first aid courses? They all essentially offer the same course, however, we strongly recommend St Mark James because of the quality and amount of courses offered. 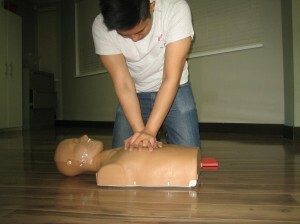 They are easily the most popular first aid and CPR provider in Canada. Standard first aid certificates are typically valid for 3 years. However, some older Lifesaving Society certificates are only valid for 2 years. Candidates may be required to re-certify at a earlier date based on employer or school policy. Ask your employer or school to determine the re-certification policy. Can I re-certify emergency first aid with a older standard first aid certificate? I need automated external defibrillator (AED) certification on my card. What should I do? Certificates received through St Mark James standard first aid program show certification and training in AED. Is my re-certification award equal to the value of my original certificate? Yes, re-cert awards are of equal value to original full courses. What should I wear to a standard first aid, CPR and AED course? Candidates should wear comfortable clothes and shoes. You will be moving around and working from your knees. Is standard first aid difficult to pass? No, most candidates do not have a difficult time passing the course. Do I have to write a test at the end? Yes, most providers have candidates write a simple test. Most candidates have no difficulty passing the written test. Yes, most providers and instructors will allow candidates to re-take the standard first aid course test if they fail.